After a few days of rushing about like a mad woman I'm back. I hoped to be able to bring you news of Radiohead's outstanding tour dates but just like the name of their web site, there is nothing but Dead Space next to a lot of US and Canadian Dates. Stay posted, I'm sure they will be released soon. 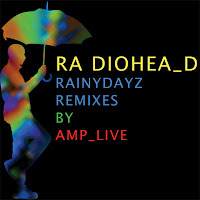 While on the subject of Radiohead, due to the crazy travel situation of the last few days, I had time to blast out AmpLive's Rainydayz remixes on my car stereo and I can honestly say that quite a few of these tracks have grown on me -my favorite being Faustz. 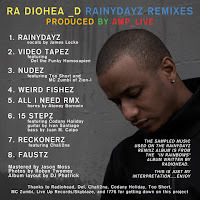 Has anyone else been listening to this remix album? Would like to know what you think. It's free to download here. Note: I noticed people trying to view this blog through IE6 or IE 5.5 are probably can't see the You Tube videos so here's the link instead and I'm trying to sort this problem out ASAP. Really looking forward to seeing these guys play at The ICA in London on March 10th. Last up for now, if you're an Elbow fan, they are set to play Q Magazine's monthly 'Q The Music Live At The Hospital' show at The Hospital in Covent Garden, London. The band will take to the stage at 8pm on Wednesday May 21. 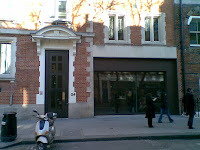 Admission is free, with tickets being assigned via lottery. If you'd like fancy being there simply email Q@emap.com with your name and contact details, making sure to include Elbow in the subject heading. Your name will then be entered into a lottery. More information can be found at www.q4music.com. The winners will be notified on or before May 9th. If you've never been to The Hospital before, here are a couple of photos I took yesterday on my way to work. 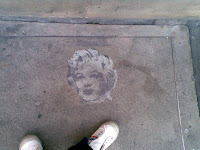 The second photo is a Banksy on the pavement outside left over from a recent exhibition held there. Loads more to tell you, check back later!